If you would like to excuse a particular student from an activity, you can exclude the grade for that activity in the grade book. This will remove the value of that activity from calculating into their final grade. There are 2 ways to do this: in the Grader report (1) and in the Single View (2). In the Navigation block, click Grades. In the Administration block, click Grader report. Click the Turn Editing On button at the top right-hand side of the page. Search for the appropriate student and grade item. In that cell, click the Edit grade (gear) icon . Note: You may want to also click the Hidden box to hide this score from this student – if you do not click the Hidden box, there is no indication to the student that this grade has been excused/removed. Alternately, enter a comment in the Feedback text box with the reason for the exclusion. Click the Turn editing off button (at the top right-hand side of the page). The word “Excluded” is displayed in the gradebook cell. Expand the drop-down menu at the top of the page and select "Single view". 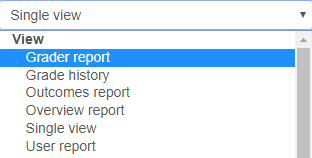 In the "Select grade item" drop-down menu, select the appropriate activity. In the "Excluded All/None" column, click the checkbox next to the student(s) you would like to exclude. A confirmation that the grades were set will appear. Click Continue. The grades will then recalculate. Click Continue. Note: Since there is no Hidden box on this page, you may want to enter a comment in the Feedback text box with the reason for the exclusion. 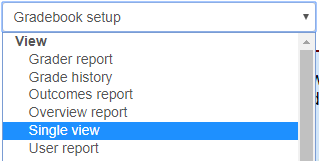 In the "Single view" drop-down menu at the top of the page, select Grader report. The word “Excluded” is displayed in the gradebook cell. In the case illustrated above, the grade items are all an even weight. In this case, the total score is determined by removing grade item 3 from the numerator and denominator. So, rather than (10+10+0)/3 the calculation is (10+10)/2. In a weighted grade book, this works a little differently. In this grade book grade item 1 is worth 20% of the course total, grade item 2 is worth 30% of the course total, and grade item 3 is worth 50% of the course total. By excluding grade item 3, this will re-scale those weights so that grade item 1 is worth 40%, grade item 2 is worth 60%, and grade item 3 is worth 0%. This is not well expressed in the grade book, but this is what is being calculated. If you would like to schedule a grade book consultation, please contact us at atlas-tlt@illinois.edu.